Human-wildlife conflicts (HWC), apart from affecting the humans and/or animal in question, also has a cascading effect in the ecosystem. The logic is quite simple; as an animal population reduces in number, every other organism affected by the presence of this animal population will be affected by its absence. Confused? Read on. Northeastern India is a particularly sensitive area when it comes to HWC. The region is known for human-elephant conflicts. Distribution of Asian elephants in Northeast India. The reason for this conflict is the increasing loss of habitat and corridors for the elephants to live and move in. Agriculture and other human land-use activities are expanding into the forest land of this already congested region. Elephants, which are large animals with large resource requirements are stressed for space and food. Also, these animals traditionally live in groups of 6-7 individuals, from adults to babies.The size of these groups are also decreasing. Further, elephants are known to migrate across their habitat regions during different times in a year. The path they take are called elephant corridors. These corridors have very special characteristics (more on this soon), and the elephant WILL NOT use them if they are disturbed. Elephants migrating in their group. This is seriously affected, leading to human-wildlife conflict. Due to smaller habitats, more isolation and restricted migration, the elephants tend to enter and run rampant on human land. Humans don’t take it quietly, and retaliate in kind when things get out of hand. When this happens, elephants are more often that not, killed. Apart from a reduced elephant population, what does this mean for the forest ecosystem of the region? Turns out, the effects are significant. Elephant population in Asia alone has decreased from 100,000 to 40,000 in the last 100 years. 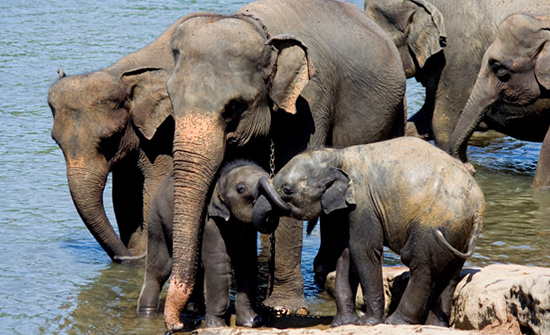 Asian elephants are a keystone species in this region; their existence is crucial to the survival of many other species. They also affect ecological processes. Elephants convert parts of the forest land into grasslands. This brings about landscape heterogeneity, diversifies the habitats in the region. When they walk, they clear paths both in the forest and the grasses. These paths are heavily trampled and often devoid of vegetation. These paths are fire breakers. They are important in seed dispersal. As they walk, they disturb many plants and distribute the seeds around the area. They tend to dig up the ground in search of water. These “water holes” are later used by many other organisms, both terrestrial and aquatic. As herbivores, they keep the vegetation growth in check. They also massively help in the recycling of nutrients by the sheer amount of excreta they produce. This excreta also works as manure for growing plants. With decreasing numbers and changing habits of these elephant populations, all of these processes are being adversely affected. As a consequence, the organisms that directly rely on elephants (like plants for their dispersal, grassland organisms like pygmy pigs) are also dying. So, here’s another reason to work to avoid human-wildlife conflict. While this reason cannot be the central purpose to manage HWC, it will help if we can keep this reason in the background so as to remember the bigger picture. Our activities can affect many, many things. We ought to be aware.